Trek Transponder is a small hi-tech box installed on your yacht or cruiser. 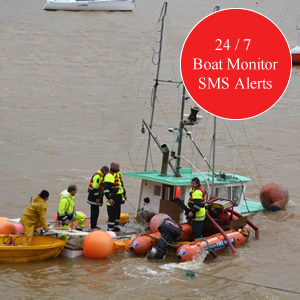 It monitors your boat 24/7 and alerts you via SMS if any abnormal activity or a problem is noticed on your boat. It is connected to the battery/batteries, shore power or solar, and sensors of your choice on board. Trek Transponder has a SIM card fitted in, so your boat has its own phone number and can send or reply to your SMS by itself. How Does Trek Transponder Work? First, Trek Transponder scans the battery voltages, its internal GPS, motion sensor and external sensors. You can send an SMS query any time to check the sensors on your boat or to get the images of your boat from the cameras. 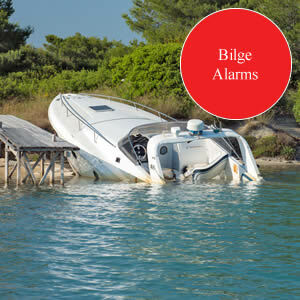 If you set the cameras to “Auto”, you will receive an image automatically if an alarm condition occurs on your boat. You can check your boat’s motion at any time as it contains a 3-axis Accelerometer. It warns you about the sea conditions and hazards that might arise on your anchored boat. 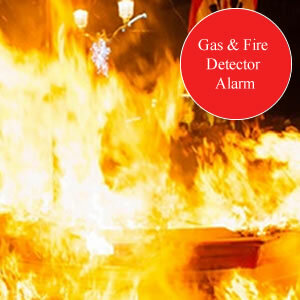 It activates a Siren or Flashing Lights for ten minutes if a security input is triggered. We can supply sensors on request. Call us and describe your boat and situation that needs monitoring and we can recommend and supply suitable sensors for your Trek Transponder. Contact us at info@trektransponder.net so that we can help you in selecting a pricing system that suits your boat. Boats can come adrift from their moorings. If your boat does, you want to find out before it hits a submerged object or another boat. Avoid the nightmare of repairs, insurance claims, raised excess and expense. Trek Transponder Geofence will SMS you if the boat moves outside your set distance. Bilge pumps fail, and if not noticed in time the damage caused can be huge, including loss of boat. Get an alert before disaster strikes and fix the problem early. Trek Transponder will SMS you if water level rises in bilge. Trek Transponder is a new Australian designed advanced technology device that allows you to monitor your boats security, location, electrics, bilge and more with your smartphone, 24/7, by SMS. So you can fix problems BEFORE they become expensive. RUINING BATTERIES IS A WASTE OF YOUR MONEY! Flat batteries are a much worse problem on a boat! Bilge pumps wont work, fridges stop – and the engine may not start. Just when the wind picks up. Repeated flattening of batteries including AGM will damage them permanently – expensive to replace. Trek Transponder will SMS you when you batteries are not charging or shore power fails. If this was your boat, wouldn’t you like an alarm? Trek Transponder can alert you to intruders on your boat giving you time to alert authorities before you find your boat ransacked, damaged or robbed. Trek Transponder will SMS you if an intruder is detected on board. Fire on board a boat can be catastrophic. Do something about keeping your boat safe. Trek Transponder can connect to an on board gas and smoke detector and can SMS you that there is a problem on board before disaster strikes. Your boat’s security is monitored by Trek Transponder and the sensors connected to it. Pressure mats (senses a person in the cockpit) and more. 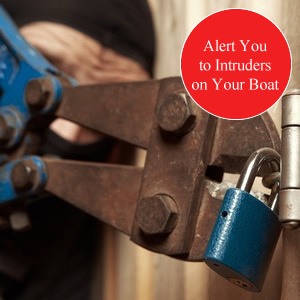 If an intruder boards your boat, you will receive a fast SMS and pictures. Your boat’s bilge is monitored by a float switch connected to Trek Transponder and will alert you by SMS if the level becomes too high. The boat’s batteries, bilge pump or pump float switch fails. The boat develops a leak. If rising bilge water is not attended to, your boat might be substantially damaged. Trek Transponder can monitor up to four battery banks of either 12V or 24V type. If they become low in Voltage, Trek Transponder will alert you by SMS. Advanced design allows Trek Transponder to operate normally even if the batteries on board are very flat and as low as 8V. Trek Transponder is designed to use a tiny amount of power less than most navigation lights and operates well on a boat in a marina or swing mooring. Your boat’s battery charging source is monitored by Trek Transponder. 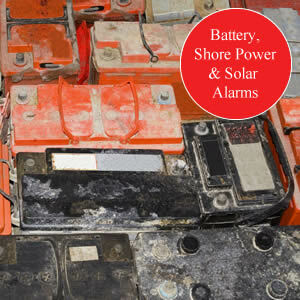 If Shore power or solar power fails, your batteries may flatten and be permanently damaged. Trek Transponder will send you an SMS if your batteries stop charging. The location of your boat is monitored by Trek Transponder every second. 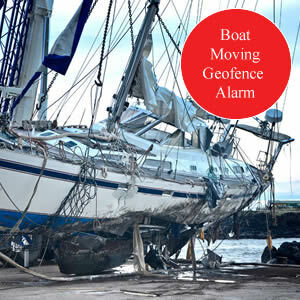 If your boat moves away from its allowed area, a failed mooring or an attempt at theft might have happened. By being alerted to your boat’s location 24/7, you can immediately remedy the problem and potentially stop a very dangerous collision with other vessels or objects under water or on the shore. Model SM100 contains a built-in Accelerometer which monitors your boat’s motion – pitch and roll. If pitch or roll limits are exceeded, you will receive an SMS alert. If you want to check the condition of the motion of your boat, the SEASTATE command will return 15 one second pitch and roll measurements at 1-second intervals with 1-degree resolution. Depending on the model, a temperature measurement input is available. This can be used for monitoring the temperature of fridges and freezers. Fridge or freezer failure can cause a substantial loss of food or bait. Insurance costs can be reduced by using a Trek Transponder that alerts you to problems beforehand. You can necessitate an insurance claim for these problems. Trek Transponder allows you to have lower cost in boating by alerting you to the problems onboard immediately. This allows you to fix the problems before they become more severe.